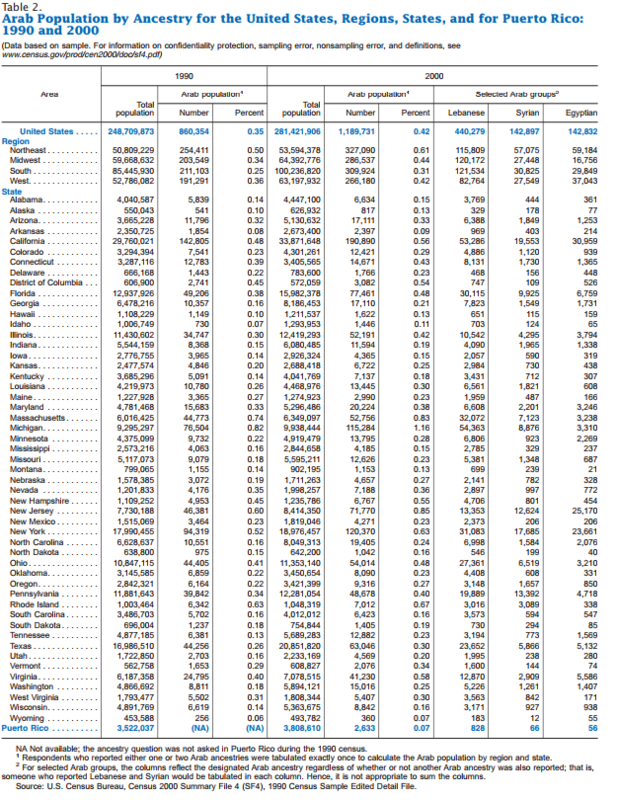 The Israel and Arab Lobbies: Arab Population in the U.S. The Arab Population in the U.S. In December 2003, the U.S. census bureau released data for the first time on the Arab population of the United States. The data is from the 2000 census. 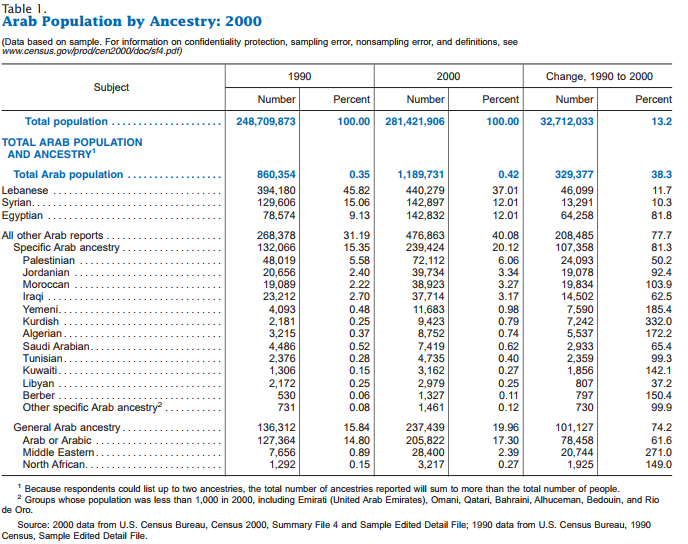 For information on the Jewish population, see Demographics. The census does not break down the figures by religion, but the Arab-American Institute estimates that about 77% of Arab-Americans are Christians (42% Catholic, 23% Orthodox, 12% Protestant) and 23% Muslim. The Arab population in the United states was approximately 850,000 in 1990, 1,200,000 in 2000, and 1,500,000 in 2010 (making up 0.5% of the U.S. population). A survey by the U.S. Census Bureau titled “Arab Households in the United States 2006-2010,” published in May 2013, offers a overview of the Arab population in the United States. Data from the survey can be found below, to read the full survey please click here. In 2000, 1.2 million people reported an Arab ancestry in the United States, up from 610,000 in 1980 (when data on ancestry were first collected in the decennial census) and 860,000 in 1990. The Arab population increased over the last two decades: 41 percent in the 1980s and 38 percent in the 1990s. Arabs represented 0.42 percent of the U.S. population in 2000, compared with 0.27 percent in 1980. More than one-third of those reporting an Arab ancestry were Lebanese (37 percent, see above table), including both people who indicated that they were only Lebanese and those who reported being both Lebanese and another ancestry, which might or might not also be Arab. The next largest specific groups were Syrian and Egyptian (12 percent each). Among the nearly half-million people who reported other specific Arab ancestries, the largest proportion was Palestinian (6.1 percent of the total Arab population). The Jordanian, Moroccan, and Iraqi populations were also sizable (3.3 percent, 3.3 percent, and 3.2 percent, respectively). About half of the Arab population was concentrated in only five states: California, Florida, Michigan, New Jersey, and New York. These states contained 31 percent of the total U.S. population. People reporting an Arab ancestry also numbered over 40,000 in five other states (Illinois, Massachusetts, Ohio, Pennsylvania, and Texas). Over the last decade, the Arab population increased in almost every state. 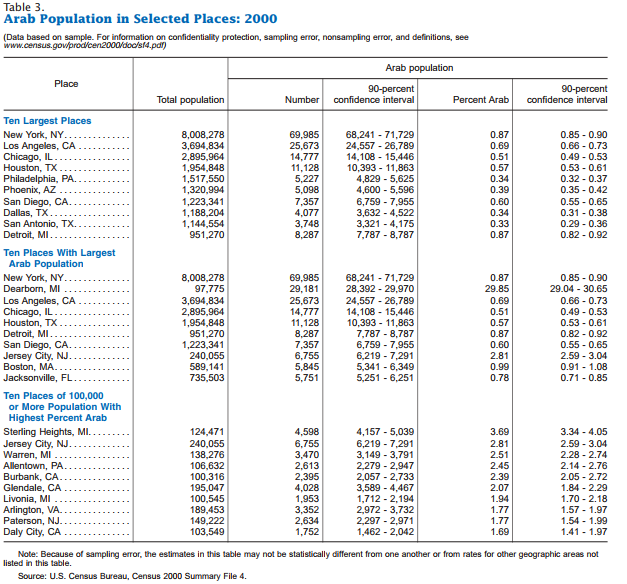 The Arab population in California increased by 48,000, more than in any other state. The proportion of the population that was Arab was highest in Michigan where Arabs accounted for 1.2 percent of the total. Arabs comprised nearly 1 percent of the state populations in New Jersey and Massachusetts, which were 0.9 percent and 0.8 percent Arab, respectively. Arabs represented a higher proportion of the population in 2000 than they did in 1990 in a large majority of states. The proportion of the population that was Arab grew from 0.8 percent in 1990 to 1.2 percent in 2000 in Michigan, and from 0.6 percent to 0.9 percent in New Jersey. The largest number of Arabs lived in New York City. In 2000, 70,000 people of Arab ancestry lived in New York, making it the city with the largest number of Arabs. Six of the ten largest cities in the United States were also among the ten places with the largest Arab populations (New York, Los Angeles, Chicago, Houston, Detroit, and San Diego.